At Weddingz, we’ve taken an oath to cover every detailed aspect of your summer wedding. No kidding. We certainly have. Going by our pledge, today we’ll be helping you in picking the most gorgeous centerpieces and table decorations for your wedding. 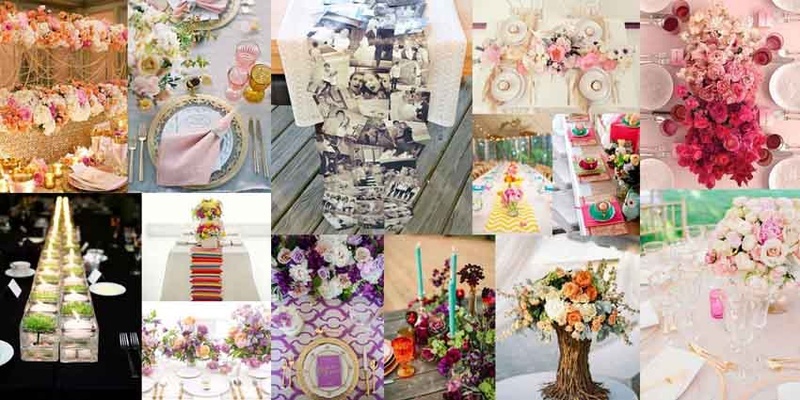 At your wedding reception other than the large stage set up and overall décor, what is closely viewed by your guests is what gets placed on the reception tables. From the most dazzling centerpieces right to the spoon and forks, your guests tend to meticulously examine and perhaps even judge your style and taste with the kind of décor you choose to display. Why not give them a visual treat, one that they remember for a lifetime. If they like it too much, who knows they might even steal some of those ideas for their son’s, daughter’s or bhatija’s wedding. Without wasting another micro-second let’s get on with the listing. Continuing with our summer wedding colour scheme in our #SummerWeddingSeries, here are our most favourite selections in wedding table decorations and centerpieces. For centrepieces you could use vases that reflect your personal style. Fanciful glasses, jars, or coiled vases are some cool suggestions. To add an extra personalized touch, you can choose to keep photo frames on the table with your photo of course. Neatly stacked red roses or tulips, little petals scattered around the table and candles are more than enough to set the right tone for a romantic wedding. You could use lanterns or different sized cocktail glasses as trendy replacement for vases. This is where you creativity is put to test. How perfectly you balance multiple colours is the game. The trick here is to keep one major aspect of the table self-coloured, while rest of the components a mix of several colours. For example, if your table cloth is white, you can use colourful flowers, but if your vases are colourful, then fill them up with pretty white flowers. Play around with the style of vases and try out mini chandeliers to add a royal touch to your wedding décor. If plain table cloths make you yawn, try out printed, crepe or satin materials for a change. Peacock coloured décor exhibit sheer majestic feeling. Use of crystal stand, blue and purple coloured vases or orchids placed in water filled vases with the right amount of lighting dropping on the table will leave your guests spellbound. Other than the fine cutlery with interesting patterns, place gemstone napkin rings to add a regal touch. Pretty pink and white flowers, vintage and lace touches make a pink wedding all the more rosy. For a change try encased candle stands with floral décor instead of traditional vases or hanging tree lights centrepieces that create a dreamy setting. From gold bottles, to shimmery gold table cloths, fine gold lace details to shiny gold fork and spoons, a lot can be done with this colour theme wedding. Did you ever think adding fruit to your décor could actually enhance the overall appearance? A weirdly cool idea of placing freshly-cut oranges whether inside water filled vase or outside onto neatly arranged flowers, they look remarkably crisp with fuschia and pink colour combination.